This new evidence and a review of the case makes it almost certain he was innocent. The evidence was discovered by a British Ministry of Defence scientist, but was never passed on to Megrahi’s lawyers, implying that the Libyan had been deliberately set-up. This is not the first claim that the circuit-board evidence was fraudulent. Even the UK Guardian reported in 2007 that the fragment was a probable fake. This however didn’t stop the mainstream media invoking Lockerbie to win public support for the disastrous campaign against Gaddafi in 2011. The prosecution’s star witness at the trial was a man named Tony Gauci, a shop owner from Malta. He identified Megrahi as a man who had bought clothing and an umbrella from him on December 7, 1988 – remnants of which were later recovered from debris at the scene. These Palestinians, including Hafez Dalkamoni (see J) and Marwan Khreesat (see B) had been arrested outside a flat in Neuss – two hours’ drive from Frankfurt, from whose airport Pan Am 103′s feeder flight had originated. They were released after five days because there was not enough evidence against them. The writer may have forgotten I for Inside Job. Although it’s complete speculation at this time, it’s possible one of the Western intelligence agencies staged a false flag attack as a pretext to take out Gaddafi. Former British agent Annie Machon notes in her book “Spies Lies and Whistleblowers” that in the 90s MI6 paid an Al Qaeda terrorist to assassinate Gaddafi, which resulted in the failed attack on his motorcade in 1996 . It’s clear there has always been a hidden agenda to get rid of him. Equally the 1984 shooting of police lady Yvonne Joyce Fletcher outside the Libya Embassy in London, officially blamed on Libyans within the embassy, was exposed in a rare Channel 4 piece as most likely being carried out from an adjacent building occupied by the British Security Services. They suggest a Libyan opposition group with ties to the CIA and Regan administration carried out the attack as a false flag to prompt Britain to wrongfully retaliate against Gaddafi. END of Guest Article whichwas first published and can be read at Eyes Wide Shut. McLean: We encountered one or two difficulties, sir. And one of the major ones was that on the aircraft there was a million sewing machine needles being conveyed and they landed with the fuselage in the sector – B Sector. And unknown to us at the time, one or two officers got pricked with the needles. And so eventually we had to spread a very large tarpaulin right along the site and move forward sort of by inch by inch. Q: The sewing machine needles were being carried as cargo on the aircraft? Q: I understand. And they were distributed around the site as a consequence? McLean: Yes. They caused a bit of a hazard, and that was the reason that the recovery of the bodies just took a wee bit longer than it would have done if we hadn\’t encountered such a hazard. The above evidence seems to have been missed by all concerned but is worthy of further examination. A million sewing machine needles weigh up to three-quarters of a ton. Who would pay airfreight charges to fly needles to America, when sea freight is so obviously cheaper? Who was the sender? Who was the end-user? Where is the bill of lading, invoice and the delivery note? Is there an insurance claim by the sender? I’ve not seen any answer for why they were cargo, if anyone has read about them please post. Found in the wreckage a diplomatic briefcase stuffed with uncut Heroine. The Needle details were largely promoted by Robbie The Pict and would seem to indicate that in fact two ‘grass cutter’ missiles were being carried on the plane loaded on a ‘diplomatic’ palet put on board in Frankfurt! I stress that this is only a theory, though one I am inclined to believe and which I put forward within a very short period after the murders, based upon information given to me from reliable sources and the reaction I met with, when I discussed it with both British and American ‘interests’! I was given to understand that a team of either 6 or 8 US Marine Police were on board. They had been working on investigations in Lebanon, Afghanistan, Iraq & Syria establishing the routings and involvement of the Bush family and their immediate associates in the drug trade – You may remember the involvement of one Oliver North in drug and arms dealing and the funding of state terrorism and The Contras in South America from a drug base in the Middle East. It was these activities the gullible and puffed up Terry Waite became inadvertently embroiled in! I was informed that the evidence was loaded on board in Frankfurt in a fireproof deed box which was locked to the aircraft frame (chassis). Interestingly despite the fact that virtually every nut and bolt and item of luggage on board was accounted for in the clean up and reconstruction no such deed box was found or admitted to. The absence of the deed box containing the evidence and provenance being returned to The USA on Pan Am flight 103 on that fateful night may well be explained by the fact that the takeoff was delayed and also the plane faced a strong headwind ensuring that when it was blown up it was, flying on a ‘great circle route’ back to Boston it was over Lockerbie rather than over the deep water off of Greenland as scheduled by the bombers. 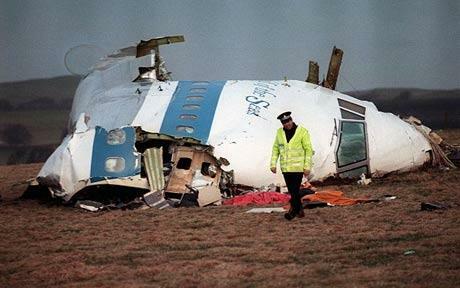 The planning and the delays can surely be the only explanation for the fact that The CIA station officer was on site on the ground at Lockerbie as a first responder and it was remarked by local police that they found themselves effectively under his command initially and for some time afterwards. It would seem that Libya became the fall guy and Qadaffi in efforts to rehabilitate his Country, which had been deliberately painted as the villain in a global game of trying to maintain The US Dollar as the reserve currency of choice in the face of the wealth created by Qadaffi and his intention of launching a single currency union across Africa & the Middle East as the Gold Dinar underwritten by Libya’s wealth and aided by Islamic interests. To Qadaffi who was Africa’s longest serving leader, who had taken his peoples from disperate warring nomadic tribes living largely in tents and following the needs of their goats in pennuary and illiteracy to the highest level of literacy in Africa where every citizen had a home and education to a high level and a fully funded health service was available with generosity to all. The wealth was generated by numerous shrewd financial arrangements and deals made by Qadaffi and his immediate allies (family members in the main) and the huge oil reserves developed and exploited by Qadaffi. A few £Billion spread around and an indifference to whether any guilt was established was a price Qadaffi paid from petty cash for rehabilitation – just as he had settled with the British government and the family of PC Yvonne Fletcher with generosity and willingly having at no time authorised her murder. At no time have I ever believed either Libya, Qadaffi or Abdelbaset Ali Mohmed al-Megrahi had any connection with the actual sabotage of the Pan Am flight 103. It has the that you understand my head! You appear to understand lots close to the following, just like you wrote the e-book there or anything. I find myself that you can do with just a few Per-cent so that you can tension the message residence a bit, nevertheless rather than of which, that’s excellent blog. A terrific study. We’ll absolutely return.